Amblyopia means decreased vision in an otherwise normal eye due to disuse by the brain. (Some people refer to this as “lazy eye,” but others mean different things when they say “lazy eye”.) Only three things cause amblyopia: eye misalignment (also called “strabismus”), unequal refractive error (such as more farsightedness in one eye than in the other), and cloudiness (such as a cataract) in otherwise clear eye tissues. If any of these is present, the brain will choose to use one eye and ignore the other (the misaligned eye, the eye with the greater refractive error, or the eye with the cataract), and will “forget” how to use the other eye. The unused eye will then lose vision, not because of any damage to the eye, but because the brain is not using that eye. As long as both eyes are open, the brain will continue to use the “strong eye” and ignore the “weak eye,” and the amblyopia will get worse and worse. Treatment of amblyopia involves making the brain use the weak eye by itself. This is typically accomplished by patching the strong eye, but in some cases can be accomplished by deliberately blurring the strong eye with a dilating eye drop. In addition it may require the removal of a cataract, if present, and/or glasses to compensate for unequal refractive error, if present. Eye misalignment can be corrected before or after the amblyopia has been treated, though Dr. Young generally prefers to treat the amblyopia first before straightening the eyes. Amblyopia can be thought of as being like concrete that was poured at birth, and which sets at about age nine or ten. This means that it is easy to get amblyopia at a young age, and relatively easy to treat it at a young age. After about age ten, it is exceedingly uncommon to get amblyopia if you didn’t have it before, and it is also extremely difficult to treat. The goal in amblyopia treatment, therefore, is to detect amblyopia at the earliest possible age so it can be treated as early as possible. 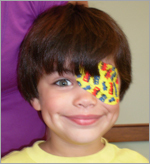 It is important to understand that amblyopia causes no symptoms. Children almost never know that they have amblyopia, because they have no reason to cover the good eye to find that they see poorly with the weak eye, so as a parent you have no way of knowing that your child has amblyopia (unless you see eye misalignment or an abnormal red reflex). Again, this stresses the importance of early vision screening by the primary care physician, ideally by the fourth birthday. If the primary care physician does not screen vision, then your child should have an eye exam by an eye doctor at age three. If a close relative (parent or sibling) has amblyopia or eye misalignment or other early onset eye problems, then you should consider strongly having an eye exam by an ophthalmologist even earlier, perhaps even in the first year of life. © 2011 Pediatric Ophthalmology Associates, P.A.